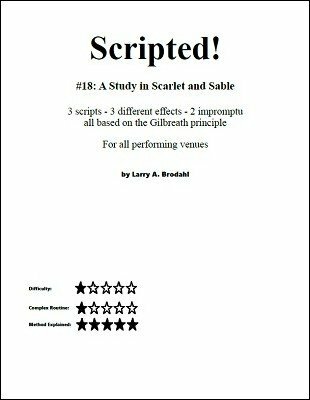 Well, the author of How To Write A Script shows how he used his methodology to write 3 different scripts that successfully explains and entertains with the Gilbreath principle. A STUDY IN SCARLET AND SABLE: The magician proves the spectator is well-adjusted. ODDS and EVENS: The magician proves how odd a spectator is. VEGAS BABY! The magician proves that he can always win at Blackjack, no matter what. This ebook gives you every line, joke, piece of timing, setup and nuance of the routine. The ebook also takes you through the an overview of some of the steps of script writing and routine design used to create the scripts. 1st edition 2018, 31 pages.